One day several months after installing my photovoltaic system, I was working frantically on a final report for a contract in Washington, D.C. The report had to be in that day by close of business, D.C. time — period. I was furiously writing, sending faxes and e-mails, and finalizing the report. At 3:00 p.m. mountain time, I hit send to deliver the report by e-mail to D.C. Only when I went into the kitchen to get a drink did I realize that all the digital clocks were flashing and that the power had been out for six hours! My computer never even blinked. The money I would have lost if I hadn’t gotten the report in was more than the cost of the PV system. As far as I was concerned, the system paid for itself in three months. Being powerless is not my only pet peeve — I also dislike the idea of my house on fire. We live in a mountain desert that is prone to drought and fire. The summer of 2002 was especially dry and it seemed as if the entire state was on fire. In every direction the smoke-filled sky looked like the Los Angeles basin. Just a quarter of a mile south of us a fire broke out. Fortunately, a fire plane was just taking off after refilling its tanks in a nearby reservoir and it was able to put out the fire. A few weeks later another fire started just north of us and burned a couple of neighbors’ houses. I panicked. I worked out the details to put one inch of rigid insulation over the existing plywood siding and under new James Hardie fiber-cement siding. That served two purposes: it increased the insulation all around the house and it fireproofed my home, reducing my home insurance rates by 15%. All this green retrofit work I did in the house was within the “footprint” of the existing foundation with very little cosmetic changes (yes, I still have the canary yellow formica in the kitchen). I worked on mini-projects one at a time, but the accumulation added up to reducing energy bills by 50% and water consumption by 30%. Yet these savings are just a small part of the gratification; peace of mind is priceless. The PV system has kicked in many times, allowing me to be productive in my office during down times. Fireproof roofing and siding are major contributors to my sense of safety. Reduced water usage protects the limited neighborhood water system. 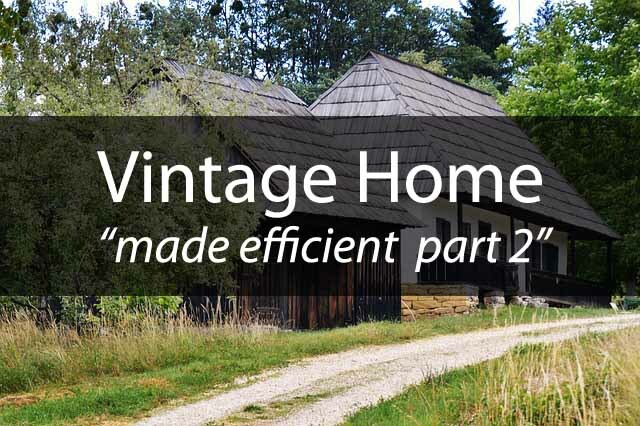 In general, greening my vintage home has been a fulfilling way to connect with my environment and to support my community.